Hey my beautiful ladies! If you are crafty and you are a quick learner and of course you like to take the things in your hands, scroll down, cause this post is perfect for you. I have made you a collection of 15 stylish step-by-step hairstyle tutorials you must see. The best thing about step-by-step hairstyle tutorials is that you can learn how to do all types of hairstyles by yourself, which will definitely save your time and money for not going to the hairstylist salon every time you need to. So, if you need to do some braided or ponytail hairstyle for a day walk, a nice updo or bun for the office, or maybe some elegant twisted or rolled updo for some more formal events like wedding, I have got you covered with the following hairstyle tutorials. So, go ahead and check them out. Enjoy! Pull your hair up into a ponytail at the crown of your head and tie it off with a thick elastic so it stays in place. Then softly tease your hair with a brush or comb. Tie a clear elastic around the pony tail about two to three inches down and pull on the bubble to make it stand out more.Continue to make as many “bubbles” as your hair can handle and you are done! If you can braid, you can achieve these ornate buns in less than a 5 minutes. This chic, and slightly bohemian braid would look gorgeous for a more casual affair or on a bride looking to let her hair down (literally) after her ceremony. A simple french twist is a classic up-do that is perfect for a variety of occasions. If you’ve ever wondered how to achieve this chic style, we have just the guide for you! Follow the steps below to see how to use chopsticks to create the perfect french twist! This inside-out braided ponytail is the perfect go-to for a cute and simple look that will keep your hair perfectly styled from yoga class to poolside! 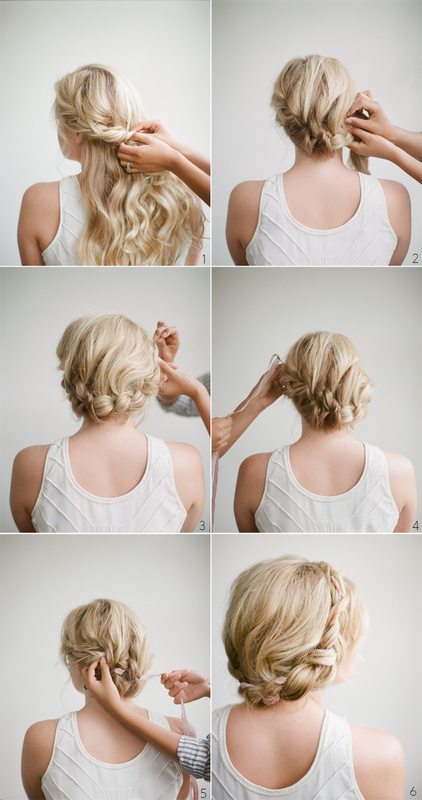 To get this fun braided look, follow the steps below! Thank you for reading and don’t forget to stay up to with the content of Fashionsy to find other inspiring step-by-step hair, nail and makeup tutorials. We will constantly update many such tutorials, so that you can find the best ones at one place.